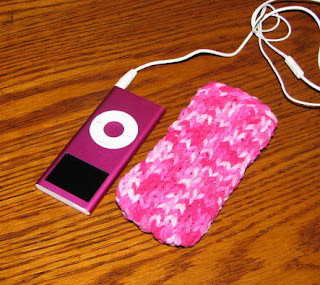 OK, so here are some pics of my recent projects, namely, Camelia, my ipod cozy, the Inside Out Sock, and the beginning of a gift sock for my friend, Claire. 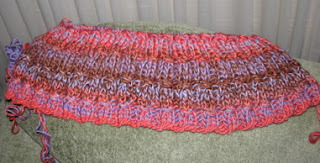 decided to use two strands of Karaoke (soysilk/wool from SWTC) in Fur Elise. I love the effect this is getting: not stripes, but a nice blended effect. I know a lot of knitters seem to hate orange, but I think even orange-haters could tolerate this combination of orange, lavender and brown. It is also hopefully hiding some of the errors I have made but reluctant to rip out. Yes, that is the hardest thing for me, still. I am definitely better but I still don’t qualify for perfectionist status by any means. I am not wild about how the Monsoon pooled on the Inside Out sock, but the sock was fun to do with the toe-up construction and the short-row heel. It kept me sane when I was sick as a dog with pneumonia last month. 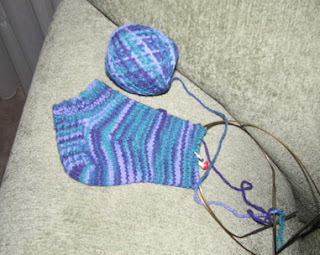 The Cascade Fixation sock for my friend is seeming very quick and easy by comparison. I love those colors, so I may have to make some for myself, however, if making two socks is a challenge due to SSS, how would I do with four? I welcome comments on all of the above! It could be my monitor but Camelia looks more pink than orange. I think orange gets a bum wrap in most cases. It can be a very flattering colour on a lot of people. 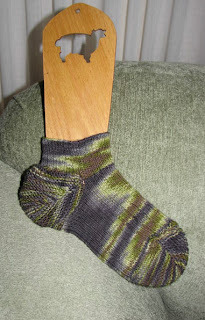 I love the pooling on the green sock – it looks great to me. Where did you get the pattern for an Inside Out sock? Second Sock Syndrome (I think that’s what SSS is) x 4 is nuts! I can’t picture it going well – I know I have 3 pairs of socks on the go all with 1 of each finished! The orange really is orange. It will be pretty! The Inside Out sock is from the Rockin sock club from Blue Moon Fiber Arts. Glad I’m not the only one with this SSS affliction. Let me know if you ever want to do a team effort! Actually, I am working on an Apricot color project right now and I love it!